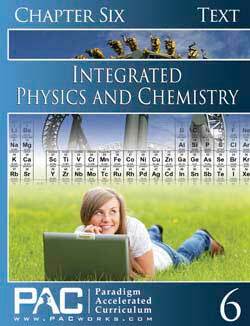 When the student completes all 6 chapters, you can assign one credits (year) for Integrated Physics and Chemistry 2. 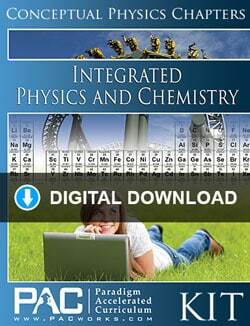 The Paradigm Integrated Physics and Chemistry 2 Digital Download Course Kit includes everything you need to complete the course in digital format: Text, Activities, and the Teacher’s Resource Kit, all in PDF format. IPC Year 2 Topics include the following. Chapter 12—Speed, energy, force, simple machines, Laws of Motion, heat, pressure, density, wave motion, light, electricity, circuits, current, power, safety with electricity, discovery by design, careers in physics, Newton, Franklin. 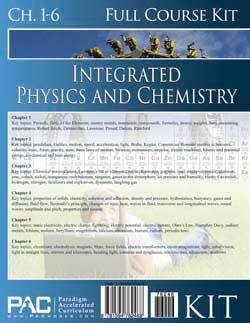 The Integrated Physics Chemistry Year 2 Text Booklet Set includes one of each of the text booklets for Chapters 7 to 12 for the extra student. 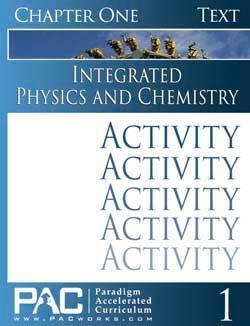 The Integrated Physics and Chemistry Year 2 Activity Booklet Set includes one of each of the activity booklets for Chapters 7 to 12 for the extra student. The Teacher’s Resource Kit for Year 2 has the Activity Keys, Quizzes, Quiz Keys, Tests, and Test Keys.